iFinance 3.0.9 is a beautifully designed personal finance application that helps you budget your money and manage stocks, income, and expenses. Unfortunately, it lacks some very basic and necessary features, making it a questionable choice over other, more full-featured applications. According to Synium Software, iFinance 3 has been totally redesigned and built to take advantage of many of OS X's latest features. 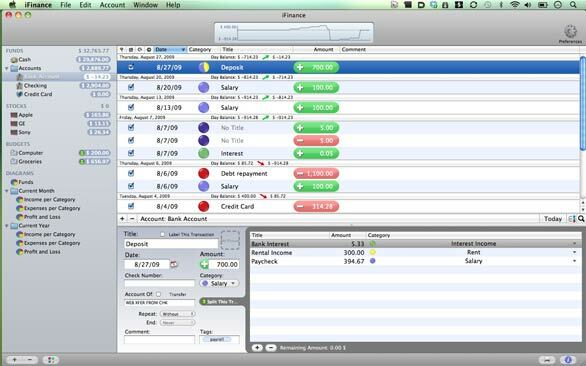 As a result, iFinance has taken on a multi-paned interface familiar to anyone who has used iTunes. The left-hand pane contains a list of all your bank accounts, stocks, budgets, and "diagrams" (graphs). Selecting any item in the left-hand pane displays detailed information or transactions associated with the account, stock, budget, or graph you've selected in the windows in one of the windows on the right side. Adding new accounts is easy and you can also organize your stocks, bank accounts, and graphs by putting them into folders. If you own stock, iFinance automatically updates stock prices and when a stock is selected in the left-hand window, displays the current price, and purchase and present portfolio values in a status window in the program's toolbar. To test how well iFinance handled my banking data, I exported account information from three of my bank accounts and imported it into iFinance. The program had no problem importing my banking data, but as I began to edit the imported data the program's beautiful veneer began to lose some of its sheen. Entering or editing your banking transactions in iFinance is, unfortunately, a process that requires you to constantly move your fingers from the keyboard to your mouse and back again. While it is possible to tab through some fields and enter information from the keyboard, in order to select categories from the keyboard you'll either have to change a system-wide Keyboard preference or press command-shift-C to open the menu. Compared to programs such as Quicken ( ), which let you tab to the categories field and start typing, iFinance requires too much effort. Also, the program's auto-type feature, where you tab to a field, start typing, and a list of categories appears and filters down to fewer choices the more you type, requires you to stop typing for over a second before the list appears and then disappears again if you continue typing. For users in the United States, here is a real a deal-breaker: iFinance provides no way for you to reconcile your banking accounts. When I asked about this feature Synium Software said that this was something they had slated for a future release, but that it was only necessary for users in the U.S., as no one in Europe uses checks. iFinance is a nice looking application but lacks too many basic features to make it a useful program. iFinance offers some very nice graphs so you can see where your money is going. These graphs are interactive and allow you to visualize the exact details of your current financial situation, but I was surprised to find that the program didn't offer any kind of printed reports. No expenses by category. No profit and loss statement. So in order to print the kind of information that you need at tax time, like a total of charitable contributions or DBA business expenses, you'll have to export your data to a CSV file and use Excel or Numbers to total everything up. While iFinance looks beautiful, it suffer from usability and lacks features, such as account reconciliation and basic reporting, that make it much less useful that it could or should be.